When I work in my craft room, I enjoy listening to music, podcasts and audio books. I enjoy this because I can listen to something while I work. Over the last six months I have really enjoyed being able to keep up with my “reading” while still getting my crafting time . 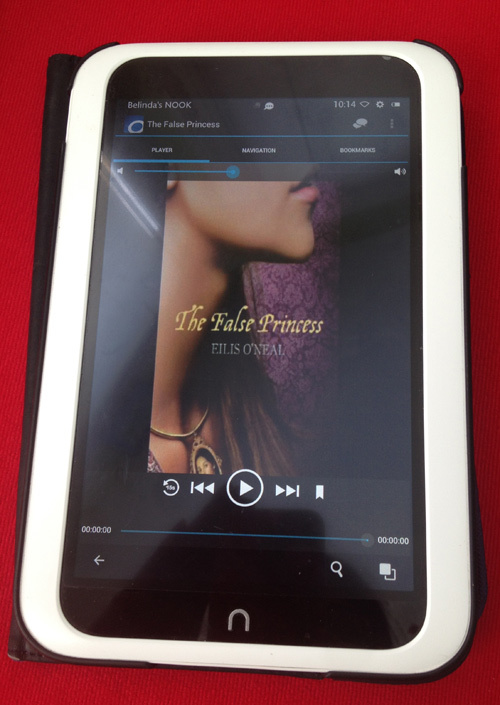 The first place I go when I need an audiobook is Overdrive since it is free from the library. I read the description, listened to a preview of this book and checked out it’s ratings on Goodreads and it sounded just like the right book to listen to. The False Princess is a fantasy book filled with magic, romance and mystery. Mandy Williams did a great job with the narration. Which I believe can make or break the listening experience. I enjoyed this debut novel by Eilis O’Neal right from the start because it brought you right into the mystery. I liked the main character Nalia who was really Sinda. She was a strong character with definite flaws. Many typical of a 16 year old girl. Which I had to keep reminding myself. Most of the women in this book were very strong characters. Sinda’s aunt despite the shock of a niece she thought had died appearing on her doorstep, did not let her poverty keep her from taking care of her niece. Filanthra, who was portrayed as a bit of a loose canon and an outsider, still managed her home with help from servants and found a place for her magic and potions to maintain her lifestyle. Melaina, although the antagonist was a very strong women that took command of the situation and planned a through deception. Which I think would have been very difficult in such a male dominated society. Perhaps magic was the great equalizer. I enjoyed the light romance in the novel with Keirnan. He was a charming friend for Sinda and a little love in stories is always good. The only thing I would say that I was frustrated with was the fact that Sinda was so strong and bright and yet they made her so naive when it came to love and romance. Over and over, her doubt presented itself and at times, I felt could be skipped. Perhaps that is how authors create drama but I felt it was a little overkill at times. Overall, I enjoyed the story and the detail and the descriptions for the settings. I felt I could really see the settings and the narration was spot on. I haven’t read many books with magic so this was a little fun for me. I ended up listening to the last few hours of the book into the wee hours of the morning to find out how it all would turn out. I think the message finding out who you really are and learning to accept yourself for who you are was a strong message in this book. Particularly with Sinda. I think if you are looking for a light read with good narration, you should give it a try. I give this book 4 butterflies.